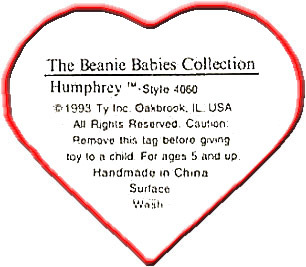 These tags first appeared on Beanies in early 1994. 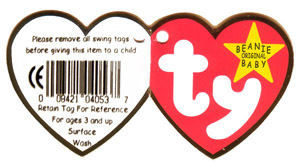 This first generation heart tag is a single tag with what is called the "Skinny Ty" printed on it. This tag is the only generation to not open like a book. 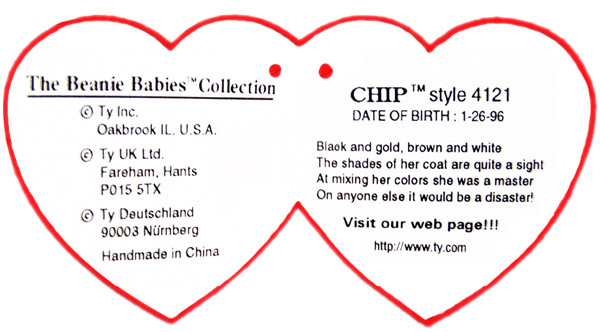 The style number, name and other Ty information is printed on the back. 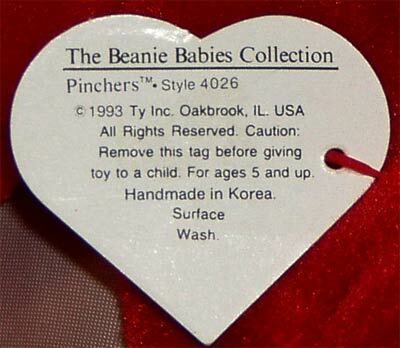 1st generation Beanies were either made in Korea or China. These tags also only appear on Beanies with a 1st generation tush tag from 1993. Beanie Babies with 1st generation hang tags that appeared in the U.K. had a special sticker stuck onto the back side of the tag. 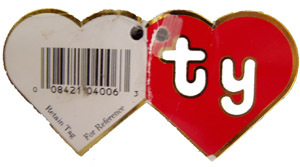 The first Ty Beanie Babies to appear in the UK through Ty Europe didn't have the heart tag at all! Instead they had a rectangle shaped white tag! The tags upper left hard corner had a black & white Ty heart, next to that it said Beanie Babies. Below that was all of the copyright and care information! 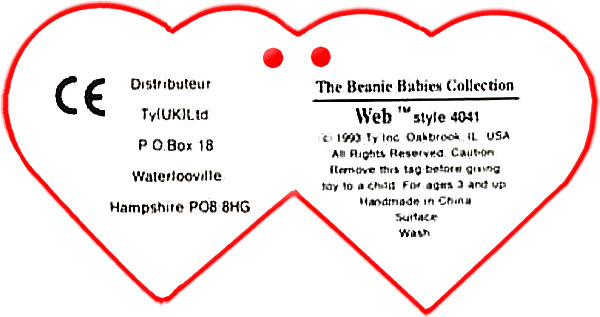 Rare Pre-Generation Tags: Some of the first tags to appear on Beanie Babies in the U.K. were rectangle in shape, these had to be made special for the U. K. because laws regarding plush in the U.K. require that the "CE" mark be present. The CE (Conformit� Europeenne) mark appears on products that meet safety standards that apply to all countries of the European Union (EU). It was created under the Single European Act and introduced to facilitate the free movement of goods (and services) within the European Union . For more CE information Click here! Only the original 9 Beanies had these rare pre generation U.K. tags. 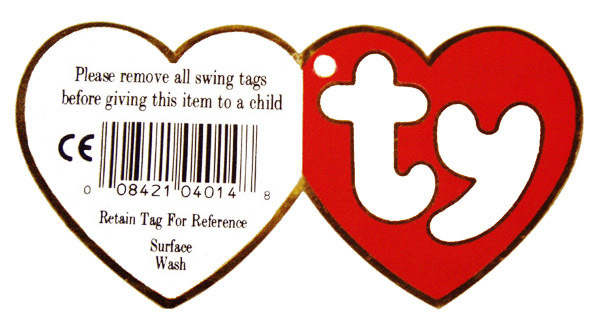 The 2nd generation heart tag was introduced during the Spring of 1994. 2nd generation tags have the same "Skinny Ty" printed on them as the 1st generation, however now the tag opens like a book. These are often referred to as the "Double Tag." 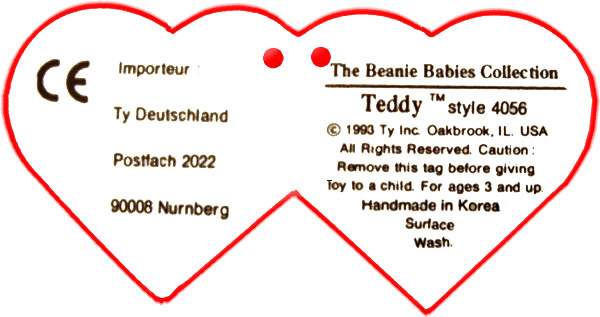 The inside left of the tag tells where the Beanie was originally distributed from, which was either: North America, the UK or in Germany. The inside right contains the Beanies name with the style number and TO/FROM following. However, not all 2nd generation tags have the TO/FROM section! Some have the copyright and care data on the right instead of the TO/FROM. The back of these 2nd generation tags contain a bar code and the words "Retain Tag For Reference." 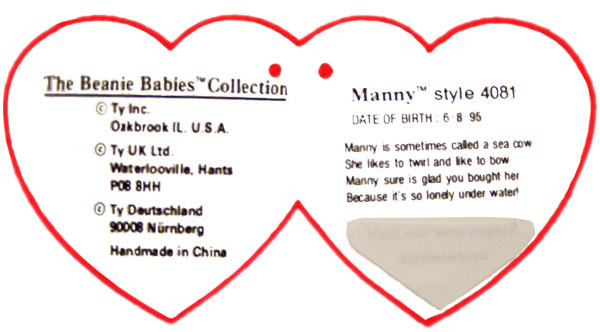 Some 2nd generation tags have the word "Handmade in China" covered up with a sticker that reads, "Handmade in Korea." 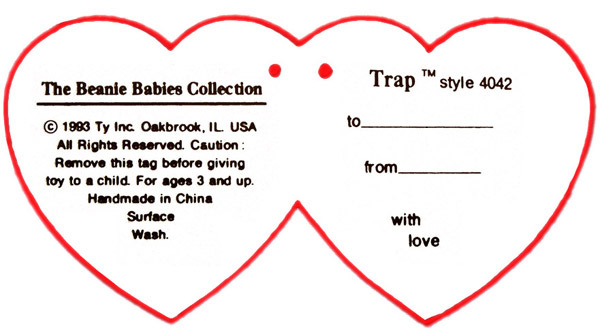 These tags only came on Beanies with 1st generation tush tags from 1993. There are three different 2nd generation tags. There are only 46 Beanie Baby styles with this generation of tags! The 3rd generation heart tag was introduced in Spring of 1995 and follows the 2nd generation tag in that it also opens like a book. These tags were the first to have the fatter "bubble font Ty logo," and also have a slightly rounder heart tag. The inside of the tags looked much like the 2nd generation. A trademark symbol was added, and three of Ty's corporate addresses were added to the inside left. "Hand made in China" or "Hand made in Korea" were also places at the bottom. Back Side Changes: At the top it now has a warning to remove the tag before giving to a child to play with. 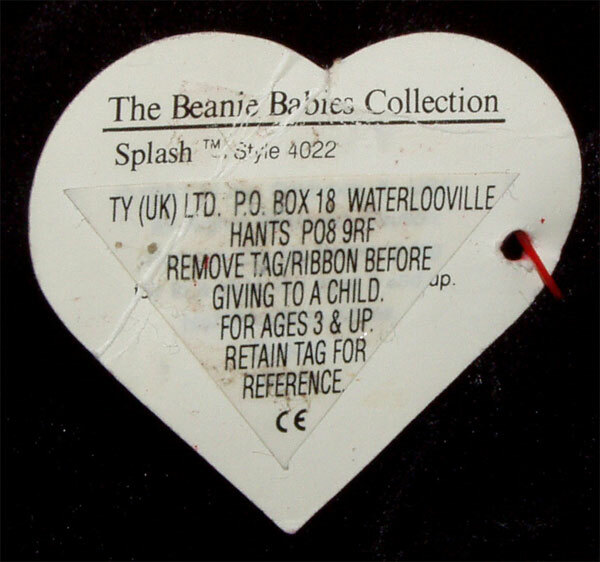 Below this it has a bar code along with the "CE" mark, the CE means that the Beanie complies with European safety standards, printed to the left of the bar code. Under the bar code is a line stating you should keep your tag for reference and that it should be "Surface Wash". 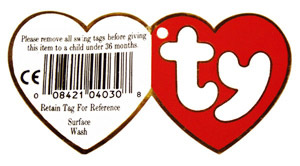 Notice version 2's tag has no "Surface Wash" and the "Retain Tag for Reference" is in the shape of a V.
These tags appear on Beanies with 1st generation tush tags from 1993 and 1995, and on 2nd generation tush tags dated 1993 and 1995. 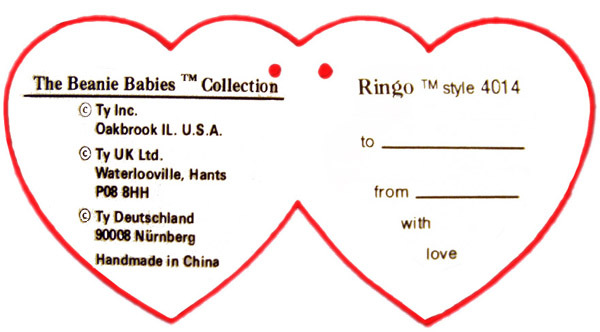 There are four different versions of the 3rd generation tags. Version 1 has only been seen on the following Beanies, Peking, Chilly, Trap and Web. The front of each version all appear the same. The key feature to a version 1 3rd generation tag is that the "to" & "from" are written in italics. Version 2 has the copyright date and care information written on the left inside of the hang tag. And the back now Retain Tag For Reference written in the shape of a "V". Version 3 has "Please remove all swing tags before giving this item to a child under 36 month" written on the back. And only the first address written on the inside left of the tag has the �. 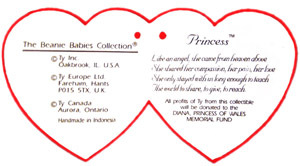 Version 4 now has the following written on the back, "Please remove all swing tags before giving this item to a child", also copywrite symbols � were added to each address listed. 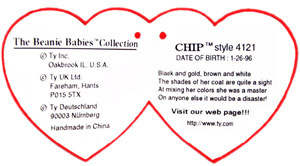 These 4th generation heart tags were introduced during the Spring of 1996. These tags are the same size and shape as the third version heart tag, but a yellow star that says "BEANIE ORIGINAL BABY" was added. 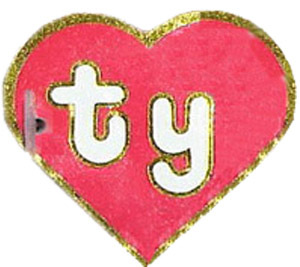 The "Ty" was shrunk a little and the gold trim was removed from the "Ty" lettering. The inside right of the tag changed some. 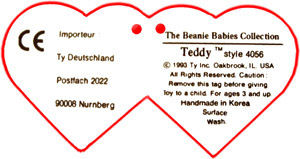 The Beanies name is now followed by "TM" and the Style number, and Ty added the Beanies birthday and a poem. 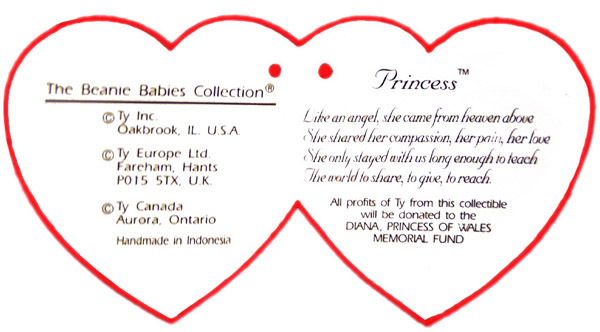 Ty also added their website address. The back of the tag now says "For ages 3 and up", followed by "Surface Wash."
There are 6 different variations of the 4th generation tag! 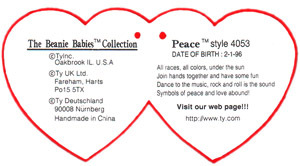 Version 1 shows the collection's name and the Ty� headquarters in the USA, UK and Germany, as well as where the Beanie Baby� was handmade. This version should have a round "CE" sticker on the back of the tag. Most of these have "Made in Korea" on them. Version 2 looks just like the first however the "Visit our website" part is covered up with a white sticker! Ty had thought he would have no problem getting the domain www.ty.com, however for legal reason (someone else owned it) he was not able to get the domain by the time the Beanies came out with the website printed on it! Version 3 looks just like the first version except instead of placing a sticker over the website address the bottom part of the tag was simply cut off! 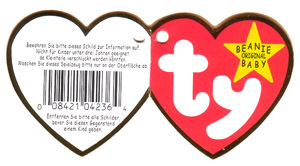 Version 4 is probably the most popular, these are made in China and have the Ty Deutschland address on them. 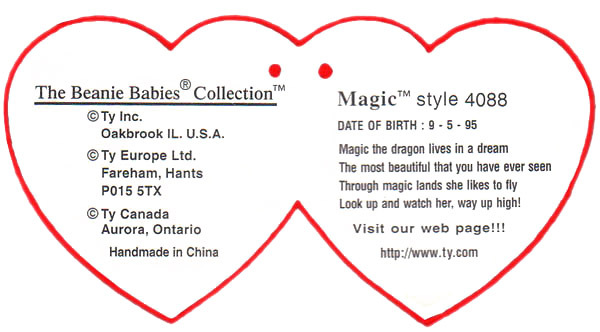 Version 5 looks just like the 4th except now a 'TM' was added after 'Collection' in "The Beanie Babies� Collection.". Also, the Ty� Deutsch land headquarters address was removed and replaced with Ty Canada's headquarters in Aurora, Ontario being added. Version 6 is vary rare and only found on the Mother's Day 1997 releases ( Baldy, Blizzard, Chip, Claude, Doodle, Dotty, Echo, Jolly, Nanook, Pugsly, Roary, Tuffy, and Waves.) Peace however did not get made with this version. These look like the 4th version however the Beanie's name is now written in all CAPS! 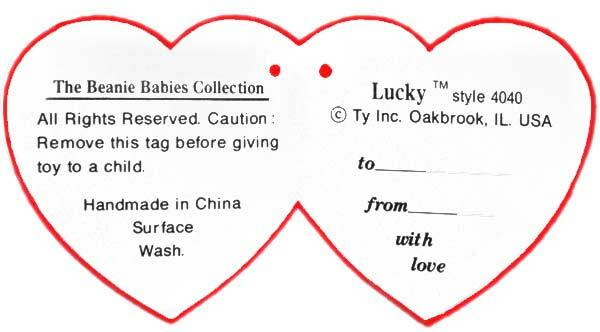 These tags are found on Beanies with 3rd generation tush tags from 1993, 1995 and 1996, and on 4th generation tush tags dated 1993, 1995 and 1996, and 5th generation tush tags from 1993, 1995 and 1996. There are 121 Beanie Babies that can have 4th generation Swing tags! These 5th generation heart tags were introduced in the beginning of 1998 and are much like the 4th generation tags however they now use the comic sans font on the inside and outside of the hang tag. 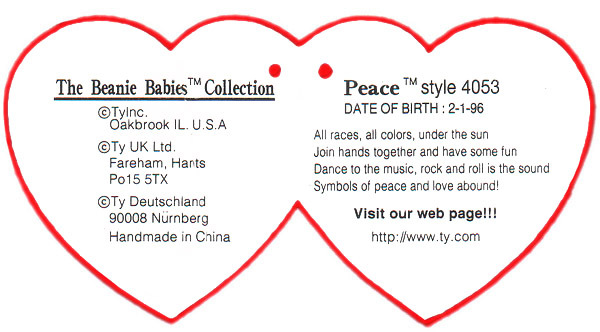 The inside left on the first line "The Beanie Babies Collection�" is now a registered (�). Also the address lines changed. It no longer mentions 'Ty Inc. USA', 'UK' and 'Deutschland', it now refers to 'Ty Inc. USA', 'Ty Europe' and 'Ty Canada'. 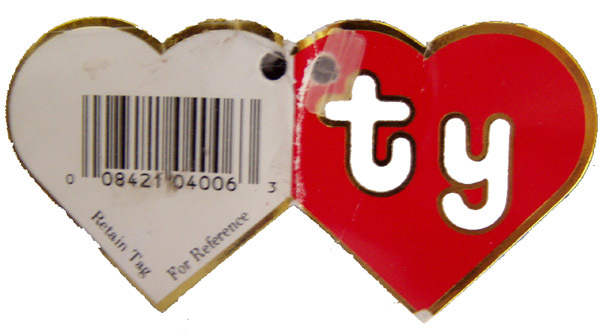 The Ty Europe address's first line can say just "Ty Europe" followed by a Gosport/Gasport address, or it can say "Ty Europe Ltd." followed by the Fareham Hants address. 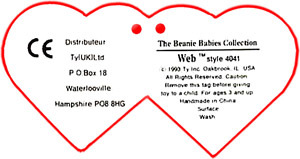 The inside right now has the Beanies birthday spelled out and the style number has been deleted and the "Visit our Web page" is replaced with only "www.ty.com". 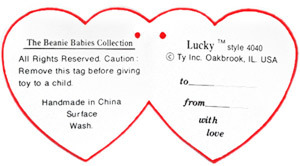 Tag Errors: Some of the original 5th generation tags had the following spelling error on the back of the hang tag, instead of reading "Surface Wash", "Surface" was misspelled as "Suface". 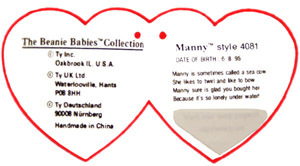 Later 5th generation tags had a small sticker covering up the error with the correct spelling, finally in the end the tags themselves were corrected. Those tags with the "Surface" spelling error almost all have the "ORIGINAL" spelling error. 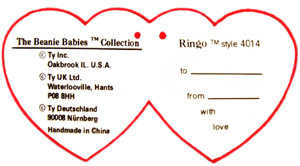 On the front of the hang tag inside of the yellow star "ORIGINAL" was spelled "ORIGIINAL" during the early releases. 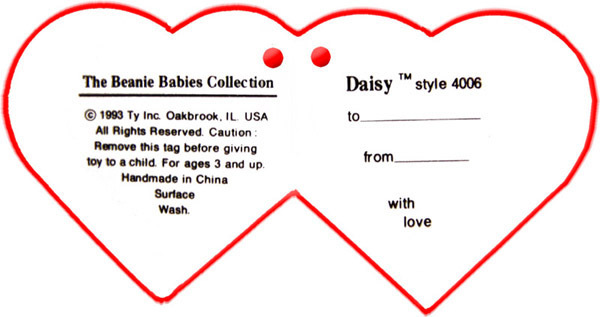 These 5th generation hang tags come on Beanies with 6th, 7th and 8th generation tush tags. There are 176 Beanie Babies that can have 5th generation Swing tags!